Cameroon’s extensive climatic, geographic and ecological diversity has not given rise to the levels of economic prosperity anticipated when the country gained its independence from both France (1960) and Britain (1961) and became a unified nation in 1972. An early track record of growth based on agriculture and forestry was bolstered by exploitation of petroleum reserves in the 1980s, promising a bright future for Cameroon’s growing population. In the late 1980s, however, sharp drops in the prices of Cameroon’s key exports – cotton and coffee as well as oil – were followed by a major devaluation of the currency in 1993 and significant declines in per capita incomes. The economy has gradually recovered, but productivity growth in the agricultural sector has not been strong and forestry exploitation is reportedly advancing at an unsustainable pace even as it generates revenues through timber exports. The agricultural and forestry sectors account for only account for about 20% of GDP, even though two-thirds of the country’s 19 million people depend in whole or in part on incomes from these sectors. Access to land and security of property rights have emerged as critical constraints on increasing agricultural productivity and as sources of conflict between different agricultural communities (e.g., between livestock herders and farming populations, between those wishing to convert forested land to perennial crops and traditional forest populations). Forestry rights have become increasingly complex and subject to active dispute. Recent efforts to decentralize management of forests to communities appears, in many cases, to have increased rather than resolved local conflicts over access to and management of this important resource. While the establishment of a legal framework for land tenure and property rights in 1974 put in place a process for land rights registration and created a framework for private ownership of property, only a relatively small percentage of Cameroonians have registered their land rights. Most continue to claim rights based on diverse customary laws, at times in direct conflict with the government, which seeks to use statutory law to enforce its own access to ―antional (that is, unregistered) land. An example that demonstrates this tension is the government’s eviction of traditional landowners to construct the 1000-kilometer Chad-Cameroon oil pipeline in 2000–2004. Population growth since 1974 has also increased pressures on land, especially fertile, well-watered agricultural land. Not surprisingly, farming women have found the security of their customary access to land to be most in question. By investing significantly in road construction, the government of Cameroon has increased both the value of much agricultural land (by increasing cultivators’ access to markets) and intra-community competition for this resource. The government of Cameroon now supports the idea of a more ―modernized‖ system of property rights (i.e., with surveys and cadastres supporting registration processes) to ensure social peace, private sector development and good governance, as well as to provide a stable source of tax revenues. A diagnostic study was conducted by the African Development Bank at the government’s request in 2009. While the study lays a useful foundation for moving forward on establishing clearer private property rights, the heterogeneity of local systems of land and forest administration and the significant economic stakes that both Cameroonians and foreign investors perceive to lie in the agriculture and forestry sectors are likely to challenge rapid implementation of any new strategy that emerges from the diagnostic. The World Bank has been the principal donor-partner in programs involving agricultural property rights. However, the Bank has also been criticized for its funding of the Chad-Cameroon Oil Pipeline project, which many observers believe resulted in the excessive abrogation of rural land rights without adequate compensation. Several donors, including the United States through its CARPE initiative and many local and international non-governmental organizations (NGOs), have engaged in efforts to improve resource governance in Cameroon’s important tropical forests. The results of these efforts have been mixed and most observers agree that sustainability of these resources is still in doubt. Many groups concerned with sustainable forest management in Cameroon have concluded that the prospects remain ―bleak until major governance challenges are overcome (FGLG 2006:1). Cameroon’s current forest legislation includes opportunities for forest communities to register rights to community forests and enter into agreements regarding their management. The legislation includes several benefit- sharing provisions intended to ensure that forest communities and local governments benefit from forest resources. But studies have found that the intended benefits are not reaching communities, in part because community management committees have often been hijacked by special interests and communities do not have sufficient decision making roles. Donors, and especially donors engaged in the region through the Congo Basin Forest Partnership (including USAID), Global Forest Watch and other initiatives, are well positioned to help the government and local authorities at the regional and community levels to design and pilot more effective programs for sustainable forest governance and management based on the lessons learned to date. In some areas of Cameroon, anecdotal evidence suggests some progress is being made in increasing women’s access to land and tenure security. In urban and peri-urban areas some women have taken advantage of opportunities to purchase or rent plots, while in some rural areas, women farmers are developing multiple avenues through which to access land (e.g., church membership, cooperatives) so they can be less dependent on their husbands for land access. Overall, however, virtually all observers concur that women farmers in Cameroon are facing increasingly insecure access to land and tenure rights. Many women have found that land scarcity has led male authorities to withdraw rights that women previously held. Cameroon is in the process of developing a new family law, which will govern issues of marital property rights. The law will hopefully be another step in helping women realize the constitutional promise of equality. Donors can assist with the development of the legal framework, and, perhaps more importantly, with public awareness campaigns and support for women’s legal aid. These efforts would help women and men learn about the requirements of the law and give them practical knowledge about how land rights can legally be transferred within families and between generations. As the 2009 comprehensive evaluation of the land administration system by the African Development Bank concluded, Cameroon must undertake a major reform of its property and land rights laws as well as the systems for administering them. There is no question that many, if not most, pastoralists, smallholders, and occupants of informal settlements in urban and peri-urban areas lack secure rights to land and that this insecurity is constraining their ability to invest, produce and prosper. Donors could help the government to develop a new land policy and revise the legal framework governing land. In addition, and perhaps more importantly, donors could support the establishment of a more effective land administration system that provides an accessible, inexpensive window for formalizing rights, with particular attention to protecting the rights of women, pastoralists and marginalized ethnic groups (such as the forest-dwelling pygmy group, the Baka). Stretching from the semiarid Sahelian zone in the north to the famed grassfields and cocoa forests of the west, and from extensive tropical rainforests in the south and east to offshore oil reserves, Cameroon has a diverse, varied landscape. The country has an abundance of natural resources capable of supporting its population of 19.5 million. Cameroon is ethnically complex, with about 250 ethnic groups, including nomadic Fulani pastoralists, Bantu farmers and a small pygmy population of forest dwellers known as the Baka. Fifty- four percent of the population lives in urban areas, with the coastal port of Douala (the largest city) serving as the business hub. The more centrally located city of Yaounde serves as the political capital of the country, which was created through the merger of regions with differing colonial histories (British in the northwest and southwest, French everywhere else). Following independence from France (1960) and Britain (1961), and unification (1972), Cameroon experienced a period of significant economic growth, fueled in large measure by its primary exports – cocoa, coffee, cotton, and timber. Petroleum exports began in 1976 and peaked in 1986. When prices for its main exports fell in the late 1980s and early 1990s, Cameroon’s economy went into a deep recession, and has regained strength only gradually since the mid-1990s. A 2001 household survey showed that although the country’s poverty rate had declined since 1996, more than 40% of all Cameroonians were poor. That number remained stable through 2007. Poverty is concentrated in rural areas, where half of the population, especially women and children, are poor. These characteristics are reflected in Cameroon’s relatively low ranking on the UN’s 2010 Human Development Index: 131 out of 169 countries reporting data. In 1974, Cameroon enacted national legislation governing land and other natural resources, with an eye toward encouraging commercial investment in its land, water, forest and mineral sectors. The laws support private property rights but require privately owned land to be titled and registered. After more than 30 years, only an estimated 125,000 land titles are registered. All untitled, unregistered land that is not designated as public land (i.e., managed by the state on behalf of the public) is considered to be ―national‖ land. Most of the land in Cameroon is classified as national land, including farmland and communal land held under customary law. The government can convert national land into state land and allocate use rights to it (e.g., forest concessions) or convert it to private ownership (e.g., for urban development). Land tenure for most people in Cameroon is therefore insecure. Decentralized Land Consultation Boards, which have significant authority over land matters, are vulnerable to politicization and bias. Cameroon has good water resources and fertile soils in much of the country. Soil degradation has become a major concern in the last 20 years as fertilizer use declined following the reduction of government support in the late 1980s and the currency devaluation of 1994. Little of the agricultural land is irrigated, but rainfall supports production, especially in the west, south and east. In northern areas of the country, rainfed agriculture and grazing are affected by droughts and low rainfall. Fewer than half of rural households have access to safe drinking water and sanitation, although nearly 90% of urban residents were reported to have safe supplies in 2006. Water infrastructure is generally inadequate to support growing peri-urban areas, and pollution from industry and untreated waste has contaminated urban water supplies in some areas. Cameroon recently privatized its water sector in an effort, in part, to address water distribution problems. Forty-six percent of Cameroon’s land is forest, including savanna, highland forests, woodlands, mangroves and rainforest. Cameroon’s southern forests are part of the Congo Basin, which is rich in biodiversity and a critical habitat for wildlife. The country’s forest law (enacted in 1994) provides a framework for community forest management and benefit-sharing. However, the state has also granted a substantial area of forest to logging concessions, most of which are foreign-owned. Deforestation is a significant threat in some areas and is most often the result of expansion of cultivation into the forest, but it is also the result of unsustainable use by local populations for timber, firewood and other forest products. Cameroon is a member of several regional bodies working to develop coordinated plans for forest conservation and sustainable use of forest resources. Although Cameroon has Africa’s smallest petroleum industry, crude oil and petroleum products have been the country’s leading export since 1976. Proven offshore reserves indicate that petroleum exports will continue for some years. Cameroon has become a partner in Chad’s oil industry, managing the pipeline that traverses more than 1000 kilometers of Cameroonian territory to the port of export in offshore waters near Kribi. The country also has significant reserves of bauxite, cobalt, iron ore, nickel and uranium, but production has lagged due, in part, to lack of infrastructure. The country has been encouraging foreign investment with favorable tax treatment and a revised minerals law. Foreign investors have begun responding and exploration has confirmed significant reserves of bauxite and iron ore.
Cameroon is a central African country whose 465,400 square kilometers of land include desert, savanna, mountain, rainforest and coastal ecosystems. The Sudano-Sahelian zone in the north is characterized by low rainfall and desert and savanna scrub vegetation. The region is extensively used for livestock production as well as cultivation of grain crops (millet, sorghum) and cotton. A band of highlands and savanna, including the Adamawa plateau, forms a transitional zone between the semiarid north and southern rainforests. Coffee and cocoa production as well as cultivation of root crops and plantains dominate in this zone. The coastal zones have high rainfall, forests and fertile land that support the production of palm oil, rubber and horticultural crops. The southern region has tropical and equatorial rainforests that are globally unique, with a rich diversity of flora and fauna. The Cameroon Volcanic Line, a chain of volcanic hills and mountains, crosses the country diagonally, rising from the western coast to the northern region of the country. Forest covers 46% of Cameroon’s mass, and 9% of total land lies within nationally protected zones. Agricultural land makes up 20% of the total land area. Approximately 0.4% of cultivated land is irrigated (Pamo 2008; World Bank 2009a; Molua and Lambi 2007). Cameroon has a population of 19.5 million (2009), 46% of whom live in rural areas. The country has a relatively low ranking on the 2010 Human Development Index, 131st of 169 countries, in part due to persistent poverty. A 2001 survey showed that despite declines in poverty since 1996, more than 40% of Cameroonians were poor. That percentage has remained constant through 2001–2007, with the actual number of poor people increasing from an estimated 6.2 million to 7.1 million due to population growth. Eighty percent of poor people live in rural areas. 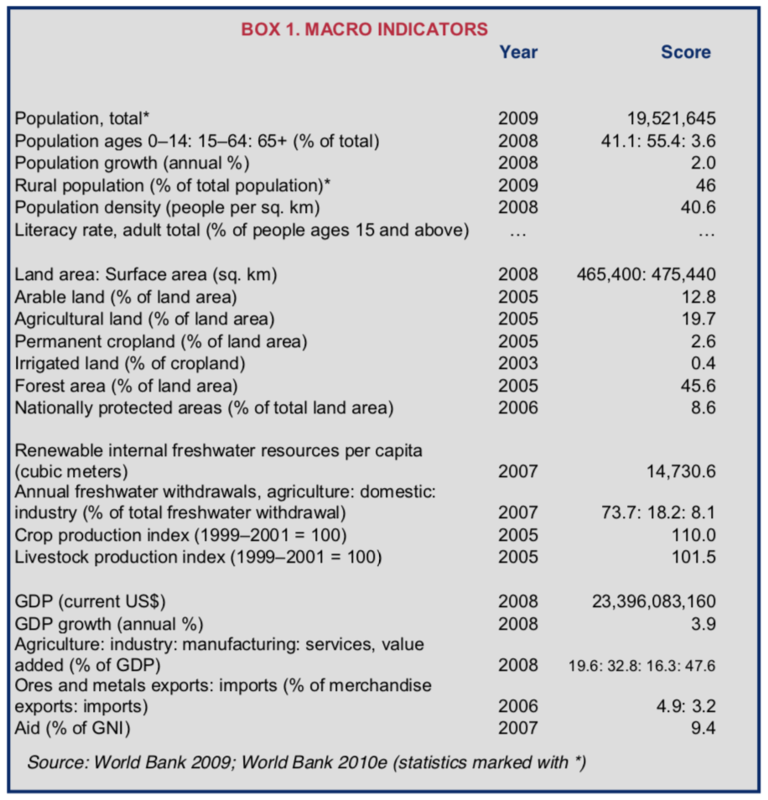 In 2008, Cameroon’s GDP was US $23 billion, with agriculture accounting for 20%, industry 33% and services 47%. The agro-silvo-pastoral sector employs two-thirds of the working population (World Bank 2010e; World Bank 2009a; FAO 2005; Pamo 2008; IFAD 2010; UNDP 2010; GOC 2009). Nomadic and seminomadic pastoralists raise cattle in the semiarid northern regions of the country. Rainfed subsistence cereal crops, including millet and sorghum, are grown in the extreme north and northern regions. The central regions of the country have varied climates and altitudes, allowing for a range of crops, including cereals, tree crops, cotton and vegetables. Plantations are concentrated in the southern region and along the coast, which is characterized by fertile soil and high rainfall. The most common plantation crops are bananas, oil palm, rubber and tea. Cocoa is grown in agroforest areas in southern Cameroon. Some cocoa production areas have been cultivated for over 100 years and are indistinguishable from closed canopy forests (Molua and Lambi 2007; Laird et al. 2007). From independence in 1960/1961 until the late 1980s, agricultural production and exports fueled substantial economic growth in Cameroon. Exports of cocoa, coffee and cotton led the way. The government provided significant support to rural producers in the form of fertilizers, extension services and marketing services. From 1977 to 1986, Cameroon experienced an economic boom, powered by petroleum exports as well as its agricultural economy. Global prices for Cameroon’s exports fell in the late 1980s, however, and government support for agriculture was withdrawn in light of falling revenues and rising government debt. A devaluation of the currency (then tied to the French franc) in 1994 caused further economic stress, but contributed to a recovery of agricultural exports. Further economic recovery since then has put Cameroon back on a path of natural resource-based growth (FAO 2009; Mvondo 2006; World Bank 2006a; USDOS 2010a). Increasingly, however, in many areas Cameroon’s agricultural producers are forced to cultivate degraded soils, forest areas and marginal lands. In the northern regions, desertification, fuelwood harvesting, expansion of cropping into marginal land, and bush fires have degraded land over time. An estimated 20–30% of the land in the northern region is bare soil, with little organic content or ability to support increased production. As the amount of available grazing land has fallen, overgrazing and incursion of animals into cultivated areas has become more common, further degrading the land and causing conflict with farming populations. In the southern and central regions, fuelwood harvesting, the bushmeat trade, and conversion of woodlands for large-scale agriculture is causing deforestation. Planting forest areas for cocoa cultivation and removal of forest to assert rights over unclaimed tracts of land has also caused deforestation. Nationally, Cameroon is losing forestland at an annual rate of 1% (Filipski et al. 2007; Molua and Lambi 2007; Kaizanga and Masters 2007). Roughly 250 ethnic groups live in Cameroon. The major tribes concentrate in five regions: the Matacam (also known as Kirdi and Mafa, 18% of population) live in the northern desert and central highlands; the Fulani occupy the northern semiarid regions and central highlands (14%); the Bamileke, Bamoun and smaller groups are located in the western highlands (38%); the Bassa, Douala and other smaller tribes live in the coastal southwest (12%); and the Ewondo, Bulu, Baka (also known as pygmies) and others live in southern tropical forests (18%). The highest concentrations of people are along the coast and in the western highlands, which have fertile land and commercial centers. Cameroon’s forests are home to about 2.5 million people, most of whom are farmers (primarily Bantu and related tribes) and Baka (traditionally hunter-gatherer forest-dwellers). Smallholder farms average roughly three hectares in size, with variations by region and economic status. Nationally, women perform 56% of all agricultural labor and are responsible for at least 60% of the country’s food production. Cocoa and coffee are grown on smallholdings, usually on cleared forestland; other commodity crops (oil palm, rubber, tea, banana) are grown on large plantations, initially developed primarily in the southwest but increasingly in the central and central southern regions. The state-owned Cameroon Development Corporation (CDC) is the largest agribusiness operating in Cameroon, with about 41,000 hectares of land and 16,000 employees (Laird et al. 2007; CDC 2009; FAO 2010). The capital city, Yaounde, is in the south-central part of the country and has about 1.4 million residents (2005). Doula, on the southern coast, is the largest city (2.5 million residents in 2005) and the country’s main industrial and commercial hub. About 67% of urban residents live in informal settlements with limited services, although most urban residents have access to clean water (75–88%) and improved sanitation (55%). Access to water is highest in established urban centers and lowest in expanded or new informal settlements, particularly in peri- urban areas. In some areas, only new housing developments designed for wealthy residents have water services (AfDB 2010; Marin et al. 2010; Ako et al. 2010; UN-Habitat 2009; USDOS 2010a; UN-Habitat 2010). Cameroon is a bi-jural country, which means that two different legal systems operate in different parts of the country. French-oriented civil law applies in eight eastern provinces, and English common law applies in the remaining two western provinces. The 1996 Constitution and 1974 Land Law apply nationally. The legal systems also recognize customary law, which, given the country’s ethnic diversity, encompasses multiple and evolving traditional rules and norms. In Muslim regions, which are primarily in the north, principles of Islamic law have been incorporated into customary law, although separate Shari’a law is also recognized (GOC Constitution 1996; Fombad 2009). Cameroon’s 1996 Constitution provides that citizens have the right to own property individually or in association with others, and ownership includes the right to use, enjoy and transfer property. No one can be deprived of property unless it is taken in the public interest, in accordance with applicable law, and subject to payment of compensation as required by law (GOC Constitution 1996). Cameroon’s primary land law, Ordinance No. 74-1 of 6 July 1974, established land tenure rules following the 1972 unification of the country. A companion law, Ordinance No. 74-2 of 6 July 1974, addressed the governance of state land. These laws created a tenure system based on land registration: all privately-owned land must be registered and titled to retain its character as private land. All unregistered land is deemed to be either public land, which is held by the state on behalf of the public, or ―antional‖ land, which includes unoccupied land and land held under customary law. The laws were intended to encourage foreign investment in Cameroon as they effectively clarified private property rights and made all unregistered land available for investment. Article 16 of Ordinance No. 74-1 established prefect-level Land Consultation Boards, and Decree No. 78/263 1978 established prefect-level Commissions for Resolving Agro-Pastoral Conflicts. Decree No. 2005/481 governs land titling and registration (GOC Land Law 74-1 1974; GOC Land Law 74-2 1974; GOC Decree 481 2005; Egbe 1997; GEF 2006). Rural land is generally subject to customary law, which is based on an evolving set of accepted principles, with some local variations. Under customary law, traditional local leaders (fon, lamido) serve as trustees and land administrators. Individual families receive rights to use land, and rights are heritable generally through the male line. Although land has became highly individualized in many areas, customary law generally prohibits individuals from selling their land outside the community (Joko 2006; Fombad 2009). In the Anglophone regions of western Cameroon, formal courts will recognize and apply customary law so long as it is not inconsistent with general principles of equity and principles of formal law and the parties agree to the application of customary law. In the Francophone regions, customary courts have jurisdiction to handle civil matters that have not been expressly reserved for the formal courts. The Land Tenure Commissions and Commissions for Resolving Agro-Pastoral Conflicts also apply formal and customary law (Fombad 2009; GEF 2006). Cameroon’s formal law classifies land as private, public or national. Private land can be owned by individuals and corporate entities, groups or the state. In order to be deemed private, the land must be titled and registered. Public land (e.g., highways, parks, waterways) is land held by the state for the benefit of the people of Cameroon. All other land is classified as national land, which includes most unoccupied land, land held by communities under customary law, informal settlements and grazing land. The state can allocate use rights to national land to individuals or groups or convert such land into the state’s private or public property (GOC Land Law 74-1 1974; GOC Land Law 74-2 1974; Njiti and Sharpe 1994). Ownership. Landowners have rights to exclusive possession and use of their land, the right to mortgage the land, and the right to transfer the land. All ownership rights in land must be registered. Most land privately-owned, registered land is in urban areas. Large commercial farms are also usually registered (GOC Land Law 74-1 1974; GOC Land Law 74-2 1974; Laird et al. 2007). Usufruct. The state can grant usufruct rights to occupants of national land. Communities that have not registered their land are generally considered to have usufruct rights (GOC Land Law 74-1 1974; GOC Land Law 74-2 1974). Leaseholds. Leaseholds can be granted by private parties or the state under terms agreed to by the parties. In urban and peri-urban areas, leasing is common. In some agricultural areas with limited land, rental arrangements are common. Sharecropping, an arrangement in which the tenant pays the landowner a percentage of the production, is a common form of tenancy, particularly in the south. In one study in Southwest Province, 49% of cocoa farmers engaged sharecroppers (Schreckenberg et al. 2002; Gockowski and Mva 2001). Profit or license (i.e., the right to take products from the land). The formal law provides that customary communities have the right to hunt on and take products from unoccupied national land until such time as the state assigns the land to a particular use (GOC Land Law 74-1 1974; GOC Land Law 74-2 1974). Under customary law, households generally have individualized rights to agricultural plots, and these are considered to be ―ownreship.‖ The head of household has rights to lease, loan and bequeath the land. In some areas, landholders are permitted to sell land held under customary law; in other areas, land sales are restricted to transactions within the family or lineage (Fombad 2009; Joko 2006; Filipski et al. 2007). Most land in Cameroon has been obtained through purchase, leasing, borrowing, inheritance, or allocation by traditional leaders. Farmers, and particularly migrants, cultivate forest areas in order to gain rights to land under customary law. Under formal law, Cameroonians occupying or using land as of August 5, 1974 (30 days after the 1974 land laws were passed) could apply for formal ownership rights to the land. However, nationwide only about 125,000 certificates of title had been registered by 2008. Only approximately 3% of rural land is registered, mostly in the names of owners of large commercial farms (AfDB 2009; World Bank 2009b; Hobbs 1998; Nguiffo and Djeukam 2008; Kaizanga and Masters 2007). The process of obtaining a land certificate includes an administrative phase relating to the assessment of land occupation and development, a technical phase relating to the physical description of the land, and a legal phase that analyzes the conditions of access to property right. The main actors are the Department of Surveys for the technical phase, the Department of State Property and the Department of Land Tenure for the legal phase and the Ministry of Territorial Administration for assessments. The formal procedure for registering land transactions in Cameroon takes 93 days and costs 18% of property value, compared to the average of 81 days and 10% of property value across sub-Saharan Africa as a whole. The registration process requires obtaining a copy of the property deed at the Land Registry, having various drafts and final versions notarized, and registering with the tax authorities and Land Registry. The registration process is generally considered cumbersome, expensive and time- consuming. The authority for registration was decentralized to local levels in 2005, with the prefect-level Land Consultation Boards assuming responsibility for demarcating land and adjudicating rights. The Land Consultation Boards and local government offices have lacked systems, equipment, financial support and training. The government recognizes the need for institutional development and capacity building at all levels and coordination of government offices in order for the process to function as intended (World Bank 2009b; AfDB 2009; Tadjundje 2007; GOC 2009). All land that is not registered is considered national land. Occupants of national land may continue to enjoy use rights according to customary law but must apply to the state (through the decentralized Land Consultation Boards) if they wish to register the land and receive private ownership rights. The extent of customary use rights varies in different regions of the country. In some areas, community members may be restricted to the production of annual crops on their allocated land. In some areas, the chief may prohibit perennial crops and tree planting in order to maintain flexibility in land allocations and prevent households from making long-term investments in the land. In areas where coffee, cocoa and other cash crops are grown, land rights are increasingly determined by the market rather than the decisions of traditional leaders applying customary law. Under customary law, pastoral land in northern Cameroon is communal land under the management of the village chiefs (Hobbs 1998; Mala et al. 2005; Pénelon 2007; Pamo 2008). Traditionally, forest-dwelling Baka (or pygmy) communities were hunter/gatherers and ranged over large areas of forestland. As the Baka have settled outside of their traditional hunting and gathering areas (many of which are now protected areas and parks), many have developed a dependency on Bantu customary landowners through relationships of servitude. In some areas, international NGOs and national legal groups have assisted in convincing Bantu villages to transfer customary ownership rights to Baka groups (Nguiffo and Djeukam 2008). While registration of urban land is more common than registration of agricultural land, an estimated 80% of plots in urban and peri-urban areas are held under customary law. Plots are obtained through renting or purchase on the informal market (UN-Habitat 2010; AfDB 2009; Hobbs 1998; Nguiffo and Djeukam 2008). In addition to costs associated with registration, gaps in the land administration processes and infrastructure have contributed to slowing the transition from customary property rights to private ownership of property. Land tenure insecurity has grown rather than diminished. Reports of multiple sales of the same land, false land certificates, and inaccuracies in boundary definitions are commonplace, and conflicts and disputes are frequent. In general, the registration process does not improve tenure security, and neither banks, landholders nor buyers rely on the system (AfDB 2009; World Bank 2009b; Hobbs 1998; Nguiffo and Djeukam 2008). As part of the state’s efforts to modernize agriculture, land has been made available to politically and economically powerful individuals and entities. With the exception of land in border areas, foreign entities can enter into long-term leases or purchase land in Cameroon, subject to the permission of the minister in charge of lands. Businessmen and high-ranking bureaucrats have obtained private property rights to rangelands, pastures and farmlands (GOC Land Law 74-1 1974; Nico Halle 2006; Pamo 2008). Historically, women’s land ownership was limited in Cameroon. In some areas where land was abundant, women were permitted to own land. But in most parts of the country, women have traditionally accessed land through their natal families and husbands. Upon marriage, most wives farm their husbands’ land. Wives are often considered the owners of crops and often control crop production and any income generated from the production, but in most cases they do not own the land. In some areas of the country, researchers have found that as a married couple ages, some men give their wives ownership rights to some land. In urban and peri-urban areas, some women use loans from cooperatives and associations to purchase plots. In general, however, men own most of the land in Cameroon. A review of registered land in 1995 found the percentage of land titled in women’s names ranged from 3% in the northwest to 15% in Centre Province (Koultchoumi 2008; Bigome Logo and Bikie 1998; FAO 2010; Mayoux 2002). separately the property each brings into the marriage; or (2) common ownership, but with the husband holding the rights to manage the property, including rights to transfer it without consent of the wife (GOC Constitution 1996; Ebi 2008; Cheka 1996; Lo 2010). The laws dealing with polygamy are similarly equivocal and allow women’s rights to be usurped. Polygamy is legal in Cameroon, but polyandry (women marrying more than one husband) is illegal. At marriage, both partners must indicate whether the marriage is monogamous or polygamous; if they choose monogamy and the husband later wants to marry a second wife, the initial marriage must be dissolved and an officially polygamous marriage entered into. If multiple marriages are not registered as polygamous, they are not officially recognized. In unrecognized marriages, the wife and children do not have rights to the husband’s estate unless the husband legitimizes the children in a court of law (Cheka 1996). However, in some areas there is evidence of increased empowerment of women and greater enjoyment of land rights. NGOs are supporting the rights of women-headed households to plots in government land projects and are assisting in formalizing women’s rights in informal areas. Meanwhile, in some rural areas women (and some men) have found their land rights threatened by the commoditization of land. In areas where land has become valuable, chiefs may require payment for land allocations. One study on the northern Cameroon border found some women responding to the limitations on land by accessing land through church membership, NGO- supported cooperatives, and development of relationships with neighbors and relatives in neighboring villages. In all of these examples, women are developing ways to continue to access land and in some cases, improve their tenure security (Drouin 2006; Fonjong 2001; Bigombe Logo and Bikie 1998; Mayoux 2002; Koultchoumi 2008). Despite the progress made, most women in Cameroon do not own land. Most women continue to access land through their husbands, and their access is dependent upon the continuation of their marriages. Barriers to more women obtaining land ownership and secure tenure include lack of knowledge of formal laws and lack of organizations supporting women’s efforts to obtain land (Lo 2010; Drouin 2006; Hobbs 1998; Egbe 1997; FAO 2010). The Ministry of Property and Land Affairs (Ministere des Domaines et des Affaires Foncieres, MINDAF), which is also referred to as the Ministry of State Property and Land Tenure, is the primary public actor in the land sector. MINDAF has authority over all land, but many of its objectives are largely focused on state land. MINDAF has overall responsibility for land allocations, land development, and land surveys. MINDAF divisions include: the Department of Land; Department of Land Tenure; Department of State Land; and Department of Surveys. In 2010, the ministry opened an office dedicated to supporting commercial investors. The ministry’s structure provides for provincial and prefect-level (i.e., division-level) offices that were intended to have primary responsibility for many land matters, including land allocations and land use planning. However, the decentralization of many functions has not been supported by the legal framework and the authority of the various levels of government for various tasks has not been well defined. Performance of the ministry and its provincial and prefect-level offices has been poor. The central and local offices have lacked technical capacity, financial support and the benefits of basic institutional development. Corruption has been a persistent problem (FAO 2010; Pamo 2008; GOC Order No. 109 2010; AfDB 2009; World Bank 2002; Tadjudje 2007). At the prefect level, Land Consultation Boards (also known as Land Tenure Commissions) make recommendations on land use, including herding and cropping, and they review and act on applications for rights to national land. The Boards are also responsible for supervising the demarcation of land, evaluating rights to land and resolving land disputes. Land Consultation Boards are comprised of the sous-préfet, a representative for the relevant technical services (e.g., public property, land tenure/cadastre, urban development), a representative of MINDAF, the chief or other traditional leader and two appointed members, who tend to be powerful community members. The northern regions and western highlands have histories of strong central customary leadership. In these areas, sultanates, lamidates, fondoms and paramount chiefdoms continue to exercise significant control over land in their territories and can dominate the Land Consultation Boards. In other areas, government officials and appointed individuals, especially those representing commercial interests, may have more power. Because of these influences, in many areas people do not consider the Land Consultation Boards to be impartial arbitrators of rights (Ebi 2008; FAO 2010; World Bank 2006a; Egbe 1997). Commissions for Resolving Agro-Pastoral Conflicts (Commission Consultative de Règlement des Conflits Agro- Pastoraux) also operate at the prefect level. The commissions are separate from the Land Consultation Boards and are intended to focus on issues of pastoral land use and agro-pastoral land conflicts. The commissions include the sous-préfet, a representative at the department level of technical services (such as surveying), the traditional chief and local representatives of herders (GEF 2006). The Ministry of Urban Development and Housing (Ministère de l’Urbanisme et de l’Habitat) is responsible for: (1) implementation of the government’s general policy on town planning and housing in towns with less than 100,000 inhabitants; (2) land registry and land management functions on state-owned land; and (3) oversight of the Special Agency for Sites and Services Development (World Bank 2002). The Ministry of Territorial Administration and Decentralization (Ministère de l’Administration Territoriale et de la Décentralisation) (MINATD) is in charge of the development, implementation and evaluation of government policy regarding administration of the territory and decentralization. MINATD has responsibility for helping design regional and local government bodies, including those governing land, and determining their scope of authority. The Ministry of Economy, Planning, and Regional Development (MINEPAT) is responsible for the development and implementation of the country’s economic policy. MINEPAT is the titular Ministry for a World-Bank funded Community Development Program Support Project (PNDP), which is designed to promote sustainable rural development by improving the legal, regulatory and governance frameworks and building the required capacities for local development (FAO 2010; AfDB 2009; GOC 2009). The formal land market is restricted to the roughly 150,000 parcels of registered land, which is primarily urban land, state land in urban development areas and commercial landholdings in rural areas. Rural land sales to foreign investors have been increasing since 2007, prompting protests of land grabbing in some areas (Devine 2010; AfDB 2009; World Bank 2002). The formal land market is hindered by the lack of a transparent, functioning system of land administration and cadastre. Fraud in land transactions and registration is so common that a decree passed in 2005 (Decree No. 2005/481 of 16 December 2005) provided that landholders whose rights are adversely impacted by a land sale and registration can bring a claim for damages for fraud, but have no claim to the land unless government error is shown. The decree nullifies multiple land certificates issued for the same land and certificates issued without adherence to procedures. The decree has not, however, rectified weaknesses in the land administration system, at least in part because of continuing issues of lack of capacity, the absence of controls and persistent corruption in the land administration offices (AfDB 2009). Most land in urban and rural areas is transferred on the informal market. Demand for urban and peri-urban land is high, and an estimated 80% of transactions in urban areas take place informally. In some areas, rural land that has been individualized can be sold to outsiders. The rural land sales market is growing in areas with limited fertile land, land with good market access, and areas being developed for commercial crops. Immigrants to farming areas such as those surrounding Mount Cameroon obtain land through land purchase and lease from indigenous communities (Laird et al. 2007; Filipski et al. 2007; World Bank 2008; Hobbs 1998; World Bank 2002). Under the 1996 Constitution, no one shall be deprived of property except for public purposes and subject to the payment of compensation under conditions determined by law. The land laws of 1974, specifically Ordinances No. 74-1 and No. 74-3, state that the government can expropriate land for public, social or economic utility or at the request of local governance bodies and public service concessionaires if they have not been able to negotiate to acquire the land. Compensation can be in cash or in kind and shall include payment for improvements and standing crops. Unregistered (i.e., national) land is compensated at the purchase price, while titled land is paid at an established state land price. In donor-funded projects, the state has tended to pay market price for all expropriated land. The law requires the state to compensate squatters where their occupation of the land is determined to be real, personal (i.e., the person squatting seeks rights on his or her own behalf), obvious and permanent (GOC Constitution 1996; Jay 2006; GOC Land Law 74-1974). In 1999, the United Nations Committee on Economic, Social and Cultural Rights noted the high number of forced evictions in Cameroon’s rural areas. The construction of the Chad-Cameroon Pipeline caused thousands of people to be evicted from their land. The project compensated people for their crops and buildings and provided in-kind compensation to communities but at least in some cases did not compensate people for the use value of the land lost. Two national parks, which were created in 1999 to offset the environmental impact of the pipeline construction, were established with little or no consultation with affected local communities. Numerous homes were destroyed and NGOs working with local Baka communities were displaced without compensation, because the Baka communities’ use of the land was less visible and thus not recognized or compensated (HLRN 2005; HLRN 2008; World Bank 2006c; Mala et al. 2005; Nguiffo and Djeukam 2008; Endeley 2010). The government has had a practice of destroying informal settlements in urban areas with inadequate notice and no payment of compensation to those left homeless. In some cases municipalities have authorized construction in certain areas, only later to declare the settlements unauthorized and destroy them (HLRN 2005; HLRN 2008). Disputes over access to land are relatively common in Cameroon. The main causes of these conflicts are changing land use patterns, increasing land degradation, increasing population densities and a lack of policies and rules for managing land disputes. Conflicts occur between pastoralist herders and sedentary farmers. Farmers have encroached on traditional grazing lands, desertification has pushed herders south and cattle numbers have increased. In the north, male cultivators have taken over land near villages after commercial crops such as coffee were introduced. Women cultivators seeking land for food crops clear land for farming at the borders of established cropping areas and moved onto open grazing lands, leading to conflict with herders. In other areas, migrants seeking land for farming have planted cocoa on forestland, creating disputes with communities that depend on forestland and its resources (World Bank 2006a; Hobbs 1998; Pamo 2008; Kaizanga and Masters 2007). Disputes relating to land transactions and land records are also common. Cameroon does not have an established cadastre and land records are poorly maintained. Land registration requirements and procedures are costly and not well known. Fraudulent land documents and land transactions, such as multiple simultaneous sales of the same property, are relatively common (AfDB 2009). Land cases can be brought to the formal court system, the Land Consultation Boards, Agro-Pastoral Commissions, customary courts or Shari’a courts. The formal court system is not generally favored by the majority of the population, particularly those living in rural areas. The municipal courts require travel to urban centers and payment of various fees and costs, involve lengthy processes, and are conducted in French or English rather than local languages. Judges are often accused of being biased toward elites and subject to political influence (Joko 2006; Fombad 2009). The Land Consultation Boards are quasi-judicial bodies established by the 1974 Land Law to administer national land and adjudicate land disputes at the prefect level. Some decisions of the Land Consultation Board can be appealed to the formal court system. Separate boards address agro-pastoral conflicts. The Commissions for Resolving Agro-Pastoral Conflicts (Commission Consultative de Règlement des Conflits Agro-Pastoraux) operate at the prefect level and resolve agro-pastoral land-use conflicts. Parties whose rights have been adjudicated have accused these specialized boards of lacking impartiality: there is limited or no public participation in the processes and no rule preventing board members from adjudicating rights to land in which they have an interest. In some cases, parties do not accept the decisions of the boards and disputes continue (Joko 2006; Njamnshi et al. 2007; Egbe 1997). In most rural areas, communities tend to use customary courts to address land issues and resolve disputes. The courts are usually run by the traditional leader and include respected community elders. In some areas career magistrates from formal courts also sit on customary courts and apply formal law, creating a hybrid institution straddling customary and formal systems. The customary courts have become a preferred means of resolving civil disputes. In northern areas where Islamic law is applied, separate Shari’a courts also operate and govern issues such as succession and marital property rights (Joko 2006; Fombad 2009; World Bank 2006a; Egbe 1997). The government’s efforts to decentralize government functions, which began in 1974, have suffered from lack of human capacity and funding, and an incomplete design and organizational structure. The first meeting of the National Decentralization Council, which took place in January 2009, gave attention to the functioning of land administration. The decentralized system that allows land certificates to be issued at provincial and prefect levels has lacked the necessary institutional development and financial support and is barely functioning. In 2008, the government issued a user-friendly document to describe the land registration process and explain land rights in general, but the document does not appear to have helped encourage land titling and registration. Only about 1,000 land certificates are issued in a year, and they are primarily granted for new urban and commercial development (AfDB 2009; GOC 2008). The country’s 2010–2020 Growth and Employment Strategic Plan (GESP) includes two strategies for addressing deficiencies in land administration: (1) build the capacity of the offices responsible for land tenure and state property; and (2) facilitate regional integration and support implementation of decentralization of land administration functions. Key programs will: (1) delimit plots and develop a national cadastre; (2) identify land for public projects and residential use; (3) reform the legal and institutional framework governing land; (4) streamline land access procedures; and (5) build human and material capacities (GOC 2009). In the agricultural sector, the 2010–2020 GESP includes the following objectives: (1) increase outputs and land surface areas by approximately 30% (compared to 2005) to ensure food security and strengthen growth by facilitating access to farmland for the establishment of medium and large farms (with particular emphasis on large-scale rice cultivation); (2) encourage development of cooperatives to increase access to inputs and credit and development of markets; and (3) develop more intensive agriculture and livestock breeding and support development of related enterprises in sectors with potential for growth and employment (GOC 2009). USAID closed its office in Cameroon in 1994, but continues to provide funds to Cameroon through USAID’s West African regional office. The Central African Regional Program for Environment, a stand-alone strategic objective within the environment sector of USAID’s Africa Bureau, implements programs in Cameroon. Cameroon is a candidate for a Millennium Challenge Corporation compact, but has not yet been approved (USDOS 2008; CARPE 2010; MCC 2008). With the support of the World Bank, in 2004 the government undertook the Community Development Program Support Project (PAPNDP), which is designed to promote sustainable rural development by improving the legal, regulatory and governance frameworks and building the required capacities for local development. The design of the project included components focusing on evaluation and revision to the legal framework governing land rights and support for land dispute resolution mechanisms and institutions. The project was implemented in 155 communes and supported preparation of more than 3,000 local development plans and several new local tax laws. In a related project the Ministry of Agriculture has implemented a 5-year (2006–2011) US $6 million Sustainable Agro-Pastoral and Land Management Promotion Project that seeks to improve the mechanism of land conflict resolution among farmers, foresters, herders, other natural resource users and traditional chiefs. Project evaluations of PAPNDP do not report on progress regarding land legislation, but the project reports a reduction in land conflicts between the Baka (pygmies) and the more sedentary Bantu people (World Bank 2010a; World Bank 2009c; World Bank 2006a). As of September 2010, the World Bank had 26 active projects in Cameroon, including Phase II (2009–2013) of PAPNDP. With funding of US $103 million, the second phase of the project is designed to improve the delivery of specified basic social services in targeted communes and support extension of the ongoing decentralization process to new regions (World Bank 2010b). National groups such as the Association of Cameroon Female Jurists have set up mobile clinics and radio programs to help women pursue legal action to secure ownership of family property at divorce or widowhood. The Coalition of Non Governmental and Community Based Organizations Working in Human Settlements in Cameroon (CONGEH), which is a coalition of 30 organizations, has established Land Consultation Clinics that work in informal settlements in urban and peri-urban areas. Clinic staff help residents gather documents to support claims to their plots and apply for formalization of rights (Fonjong 2001; Pamo 2008; Drouin 2006). Cameroon has four major aquifers and a network of rivers. In the north, the Logone River flows into Lake Chad. The Benoue River also runs north, emptying into the Niger River in Nigeria. In the south, the Ntem, Nyong, Sanaga and Wouri rivers flow west into the Gulf of Guinea. Major wetlands include mangrove forests on the coasts and the Yaeres floodplains in the northern Waza Logone region. Lake Chad, at the tip of the extreme north of the country, is shared with Chad, Nigeria and Niger. Cameroon has tectonic lakes (Ossa, Dissoni and Ejagham) and several volcanic lakes that store carbon dioxide and other gases below their lake bottoms. Scientists believe that in 1986 heavy rains disturbed the bottom of Lake Nyos, causing an expulsion of carbon dioxide that killed 1,700 people in the villages surrounding the lake (SDSU 2006; FAO 2005; Moula and Lambi 2006). Cameroon has 284 billion cubic meters of annually renewable water resources (14,730 cubic meters annually per capita), indicating an overall state of water sufficiency. However, the country’s water resources are unequally distributed. The northern Sudano-Sahelian zone receives the least amount of rain, between 300 and 900 millimeters annually. The central Sudanian zone receives about 1000 millimeters per year, and the equatorial zone in the coastal and southern regions receives an average of approximately 2000 millimeters of rainfall annually. On the coast, Debundscha has one of the highest levels of rainfall in the world, with an annual average of 10,300 millimeters (World Bank 2009a; FAO 2005; Moula and Lambi 2007; Moula and Lambi 2006). Water is used primarily for agriculture (74%) followed by domestic use (18%) and industrial use (8%). Sixty-four percent of Cameroon’s population has access to an improved water source, with considerably higher rates of access in urban areas (75–84%) as compared to rural areas (41–45%). Rural water is primarily available from springs, wells and boreholes. In some more developed areas, gravity or pump-based drinking water systems are used. Rural water quality is generally high because of low use of pesticides and chemical fertilizers and limited industrial development and mining. In urban areas, water is often polluted from industry and inadequate waste treatment. Supply is also inconsistent, and inaccessibility to potable water in Douala and Yaounde has led to outbreaks of disease (AfDB 2010; World Bank 2009a; FAO 2005; Njamnshi et al. 2007). Cameroon has between 158,000 and 290,000 hectares of potential irrigable land, with the high end of the range including land that would require expensive infrastructure to develop. Roughly 26,000 hectares of land are irrigated. In the north, groundwater is used for irrigation while in the remaining parts of the country, irrigation water is drawn from surface waters. During the economic crisis of the late 1980s, the state largely withdrew from development and maintenance of irrigation infrastructure. The state has tried to encourage the private sector to invest in irrigation without significant success (FAO 2005). Ninety-seven percent of the country’s electricity supply comes from hydropower. However, only about 5% of the rural population and 65% of the urban population have access to electricity. Most of the population depends on biomass for their energy needs. Cameroon has the second highest hydropower potential in Africa (after the Democratic Republic of Congo), and only 2% of Cameroon’s potential is developed. The Sanaga River and its tributaries currently support two hydroelectric plants. The 30-megawatt hydropower Lom Pangar dam, which is being built on the Sanaga River in East Province, is slated for completion in 2012. Another dam is planned at Nachtigal, 165 kilometers east of the country’s economic capital, Douala. The planned 1000-megawatt facility will power an aluminum smelter at Kribi (Binyuy 2006; Nyuylime 2009; FAO 2005; Reuters 2009a). Under Cameroon’s Water Law (Law No. 98/005 of 14 April 1998) water is a natural resource within the common heritage of the country. The state is responsible for managing the country’s water resources and facilitating access for the entire population. However, the Water Law expressly contemplates the state’s ability to transfer its obligations to manage the water resources to local authorities and other entities, a provision that allows for the public-private partnership model of urban service delivery adopted by Cameroon in 2007. The law prohibits discharge of chemicals, sewage and other harmful substances into water resources and protects water quality (FAO 2005; Marin et al. 2010). The government passed several water resource–related decrees in 2001: (1) Decree No. 2001/161/PM 8 May 2001 established the powers, organization and functioning of the National Water Committee; (2) Decree No. 2001/162/PM 8 May 2001set rules protecting areas around abstraction points and standards for processing and storage of water; (3) Decree No. 2001/162/PM 8 May 2001specified terms and conditions of water extraction surface or groundwater for industrial and commercial uses; and (4) Decree No. 2001/162/PM 8 May 2001specifies rules for the protection of surface or groundwater against pollution (GWPCM 2008). Decree No. 2005/494 of 31 December 2005 created the Cameroon Water Corporation (Camwater), a state-owned asset-holding company. The legislation served as the foundation for the creation of a public-private partnership for the delivery of urban water (GWPCM 2008; Marin et al. 2010). Under Cameroon’s formal laws and regulations, the government is responsible for supplying the population with adequate drinking water, and users are required to pay for the service. Industrial and commercial water use is subject to state regulation and fees (GOC Water Law 2005; Manyong 2006; AfDB 2010). Under customary law, local communities generally have the right to use water from lakes, rivers and other surface waters. In some forested parts of southern Cameroon, access to aquatic resources is based on inheritance of rights from mothers to daughters-in-law. Access also depends on the types of fishing available on a river and the size of the river (Joko 2006; Mala et al. 2005). In rural areas, women and children are responsible for fetching water for the entire household. Those without access to a piped water source must often travel long distances to rivers and lakes. Those who cannot travel are often forced to buy water from private vendors who charge households many times what is charged for piped water (Bongkiyung 2010). The Ministry of Energy and Water Resources (MINEE) has primary responsibility for the sector and is responsible for developing, implementing and evaluating policies regarding water resources and exploitation of the water resources. Within MINEE, the Department of Water Resources and Hydrology (DHH) is responsible for rural drinking water. As rural water supply networks develop, they will be managed by water point management committees or contracted out to private entities as networks grow. The Ministry of Agriculture oversees irrigation and drainage, and the Ministry of Scientific Research and Technology runs the Center on Hydrologic Research (AfDB 2010; FAO 2005). The Ministry of Urbanism and Housing has overall responsibility for the delivery of water in urban areas. In 2007, the government restructured the urban water sector. The assets of the former national water utility, the Cameroon National Water Corporation (la Société Nationale des Eaux du Cameroun, SNEC), were transferred to the state-owned Camwater. Camwater has a concession with the government for service delivery in urban and peri-urban areas, which it delegates to a consortium led by the Moroccan public utility, the Office National de l’Eau Potable (ONEP). In 2008, the ONEP/Delta Holding Ingema Consortium began providing production, transportation, and distribution of drinking water through the newly established local private company, Camerounaise des Eaux (CdE). Camwater is responsible for infrastructure development and for financing investment in the water sector (Marin et al. 2010). In 2001, the government established a National Water Committee, with members from a host of ministries, including ministries of public health, territorial administration and agriculture. The Committee is responsible for helping the relevant ministries develop policy and has an oversight function (Berthelemy et al 2004; FAO 2005; GWPCM 2008; AfDB 2010). Access to water in urban areas has suffered from insufficient production capacity, lack of network maintenance and lack of basic infrastructure. New water customers were required to pay upfront connection costs that were prohibitive for low and middle income households (equivalent to five to nine months of household income). The government undertook a major restructuring in 2007, and adopted an innovative approach to service delivery. The public-private partnership for the delivery of urban water uses an affermage model and was the first subsidized water connection program in West Africa to be implemented through an output-based aid mechanism. Under the affermage model, customers pay the private operator, CdE, a fee that covers CdE’s costs of installing new connections and providing water and government tariffs. CdE remits a percentage of the fee collected to the government. CdE’s profit is tied to the volume of water sold and is therefore incentivized to expand coverage, especially as Camwater is responsible for financing any necessary network infrastructure development. In order to ensure that poorer households (who often have low water consumption) are covered, Camwater and the Global Partnership for Output-Based Aid (GPOBA) agreed to share the cost (US $10 million over four years) of providing a partial subsidy for 40,000 households to obtain water connections (Marin. et al. 2010). The rural water sector has suffered from limited capacity of departments, agencies and local councils to govern water resources; multiple stakeholders with overlapping roles and responsibilities; lack of maintenance of equipment and infrastructure; and inadequate financial resources. Only approximately 45% of the rural population has access to safe drinking water. In 2007, the government adopted a rural Drinking Water and Sanitation Sector (DWSS) policy and a 2008–2015 action plan to achieve 80% rural coverage by 2015 through increased investment in infrastructure development and rehabilitation and institutional development (GOC 2009; AfDB 2010). The Cameroon Water Partnership (also known as the Global Water Partnership–Cameroon) is a multi-stakeholder body formed in 2005 to work with the government to develop policy and programs for the sustainable management of the country’s water resources as a contribution to alleviating poverty, improving socioeconomic well-being and protecting natural resources. The Partnership is a regional branch of the Global Water Partnership, which was founded in 1996 with support from UNDP and the World Bank. The network is open to all organizations involved in water resources management, including governments, donors, agencies and the private sector. The Partnership provides a forum for dialogue and exchange of information for all stakeholders in the water sector and supports capacity building and training of stakeholders in the water sector on principles of integrated water resources management (GWPCM 2008; GWP 2010). The African Development Bank is funding the $11 million Rural Drinking Water Supply and Sanitation Project. The project, which has a 4-year term (2010–2014), covers the northwest, south, west and southwest regions of the country and is being implemented by the Department of Water Resources and Hydrology. The project plans to construct 88 simplified drinking water system networks with the goal of providing roughly 668,000 people with sufficient water at close proximity (no more than 500 meters) (AfDB 2010). The Global Partnership for Output-Based Aid (GPOBA) helped design the public-private partnership structure for the urban water sector. GPOBA is a partnership of donors and international organizations working together to support output-based aid approaches. Current partners are the World Bank, AusAID, DFID, Sida, DGIS and IFC. The World Bank is also helping fund the 5-year, US $83 million Urban and Water Development Support Project for Cameroon, which runs to 2012. The project is being implemented by the Ministry of Urbanism and Housing with the support of the Global Partnership for Output-Based Aid (GPOBA), which helped the government with the restructuring of the sector and creation of the public-private partnership between Camwater and ONEP-CdE. As of December 2009, the project had been launched in Bamenda (western region) but has been slow to implementing the water access infrastructure activities. More than 5,000 social water connections (connections shared by multiple households) were established as of December 2009, providing direct access to water supply for low-income consumers. In addition, a number of capacity building activities had taken place and progress had been achieved regarding finalization of an urban strategy (World Bank 2009c; World Bank 2010c; GPOBA 2010). Forty-six percent of Cameroon (about 214,000 square kilometers) is covered in forest. The country has highland and mountain forests, northern savanna and woodlands, mangrove forests and dense rainforests. The forests are home to about 936 species of birds and 211 species of mammals, including giant pangolin, panther, gorilla, forest elephant and the red river hog. Cameroon has numerous unique forest ecosystems, including the Dji-Odzala- Minkebe Tri-National Landscape (TRIDOM), which is a large lowland forest wilderness spanning Cameroon, the Republic of Congo and Gabon. The Cross-Sanaga-Bioko Coastal Forests eco-region, which comprises the lowland and coastal forests of southeastern Nigeria, southwestern Cameroon and the island of Bioko, includes dense mangrove forests and about half of the 7,000–8,000 plants endemic to tropical West Africa (WWF 2001; University of Maryland 2010; Cerruti et al. 2008). Lowland rainforests, which are located in the eastern and southern regions of the country and the savanna transition zone in the country’s center, tend to be relatively sparsely populated. The coastal plain and mountainous areas of the west and northern provinces have higher population densities. Cameroon’s people use the forest for hunting, grazing, timber, fuelwood, cultivation and the harvest of a variety of non-timber forest products, including bushmeat (Cerruti et al. 2008; Egbe 1997; Monagabay 2006). The Baka, Bakola, Bagyéli and Bedzang (all part of the group known as pygmies) are the oldest continuous inhabitants of Cameroon’s forests and live mainly in the southeastern region of the country. There are an estimated 76,000 pygmies, half of whom are Baka. The pygmies have traditionally been hunter-gatherers, using the forest as their source of food and health, recreation, and cultural and spiritual celebration. Over time, they have become more sedentary. The pygmies have been discriminated against since colonial times and are among the poorest and most marginalized people in Cameroon (CED et al 2010). Cameroon’s forests are threatened by degradation and deforestation. About 80% of forest loss is attributed to the use of slash and burn cultivation practices and the development of new areas for cash crops, especially cocoa. Illegal logging is responsible for an estimated annual loss of 540,000 cubic meters of wood. The bushmeat trade also contributes to forest degradation and deforestation. The development of Cameroon’s mining sector, which will require development of expensive infrastructure within the forests, is also expected to have a negative impact on the forests. In some areas new mining concessions overlap with existing logging concessions, creating the potential for conflict and pressure on forest resources (Essama-Nssah and Gockowski 2000; Mala et al. 2005; Cerruti et al. 2008; Ngome 2006; Karsenty 2007). The 1994 Forest Law (Law No. 94/01 of 20 January 1994) states that the ownership of the country’s forests is as defined by land laws and the specific provisions of the Forest Law. The state is responsible for the protection of the country’s forests and sets a standard of maintaining at least 30% of total land area as protected, permanent forest. The Forest Law recognizes three types of forests: (1) state forests (e.g., nature reserves, national parks, reforestation areas, forest plantations, buffer zones); (2) collective, private and council forests, to which citizens have harvest rights, but whose uses are restricted; and (3) national domain forests, which includes all other forestland (GOC Forest Law 1994). The government passed a number of decrees in 2006–2007 that were designed to support further commercial investment in the sector and poverty reduction goals through support for sustainable management of forests. The decrees reclassified forest products, allowed for small-scale logging permits, set standards for sports hunting permits and provided for forest monitoring (Cerruti et al. 2009). Customary law in Cameroon governing forestland varies by region and community, but in general, communities tend either to regard forests as an open access resource in which people are free to use the forest products without restriction, or as a communal resource in which use of forestland and resources is subject to some measure of control by traditional authorities. In some areas, forested land up to three kilometers from a village is recognized as exclusively being for the use of the village, while land beyond three kilometers can be used as common area for several villages. Individual community members can obtain individualized rights to forestland by clearing the land for cultivation and maintaining crops or recognized fallow periods. The customary right of a community to gather forest products in unprotected areas, as recognized by the Forestry Law, can be temporarily or permanently suspended for reasons of public interest, but the holders of these use rights must be compensated (Egbe 1997; Filipski et al. 2007; Hobbs 1998; Pénelon 1997). About 34% of Cameroon’s forestland is classified as production forest, 24% as hunting zones and 12% as national parks. About 20% of the forest is classified as national forest. The final 10% of forestland includes recreational forests, botanical and zoological gardens, eco-reserves, protected forests, wildlife reserves and sanctuaries and council forests. State forests are managed by the state in accordance with objectives of conservation, production, recreation and protection of biodiversity. National forests are available for multiple uses, but certain activities, such as grazing and logging are subject to regulation. Private landowners with forests are required to submit a management plan to the forest department that indicates how forest resources will be managed sustainably (GOC Forest Law 1994; Cerruti et al. 2008). Concessions for logging are available under the Forest Law for parcels up to 2,500 hectares, with no concessionaires receiving rights to more than a total of 200,000 hectares. Concessions are granted for renewable periods of 15 years and are evaluated every three years. Concessions are not generally tied to a forest management plan, and there are generally no restrictions on the methods used. Logging companies that have been granted forestry concessions must allocate a percentage of their profits to villages that border their concessions, paying through the public treasury. Cameroon also has a system that distributes half of its Annual Forestry Fee (redevance forestière annuelle, RFA) revenues to decentralized public authorities (40%) and villages (10%) that are adjacent to exploited forests. Studies have found that the requirement has in many cases not had the intended beneficial impact on local forest communities because of problems with diversion of funds, inadequate accounting systems and lack of transparent management of funds (GOC Forest Law 1994; Oyono et al. 2006; Larson and Ribot 2007; Morrison 2009). The Forest Law provides for community forest management. Communities with customary rights to forestland can organize as a legal entity and apply to register up to 5000 hectares as a community forest. To establish a community forest, communities must map the boundaries and inventory the forest resources. The community and the forest service enter into a management agreement for a maximum period of 15 years. Communities receive profits from forest enterprises, and the right to establish a community forest supersedes plans for opening the forest area for logging concessions. Forestry officials can suspend the management agreement without warning or appeal. As of 2009, 177 community forests covering 632,000 hectares had been registered and 143 had approved management plans (GOC Forest Law 1994; Cerruti et al. 2008; Karsenty 2007). The process of establishing a community forest requires up to two years and significant financial resources (up to about US $55,000) to undertake the mappings, meetings and agency certifications. Communities require support of outside entities to fund the process. Continuing relationships with the funders, which may be NGOs or commercial entities, may impact the establishment of the community forest governance bodies and their operations. Studies of Cameroon’s Community Forest Management Committees have found that many operate without full community participation and lack transparency and accountability, especially with regard to benefit sharing. Rents are often captured by local elites who make alliances with loggers who, in turn, use the community forest as a way of avoiding regulatory constraints on the concessions, such as the requirement for management plans, and to evade taxes (Oyono et al. 2006; Mvondo 2006; Karsenty 2007). The Forest Law grants communities the right to cut trees to meet domestic demands for fuelwood in unprotected national forests, subject to oversight by forestry officials (GOC Forest Law 1994). Under the customary laws of most forest communities in Cameroon, persons with locally recognized and legitimate claims to a parcel of land have property rights over the trees on that land. If someone has only temporary use rights to a parcel of land, the use holder does not have ownership rights over the existing trees. In some areas, forested land up to three kilometers from a village is recognized as exclusively being for the use of the village, while land beyond three kilometers can be used as common area for several villages, potentially creating a basis for conflict over control of the land and forest resources (Hobbs 1998; Pénelon 1997). The Ministry of Forestry and Wildlife (Ministère des Forêts et de la Faune, MINFOR) is the primary body responsible for Cameroon’s forests. MINFOR and the Ministry of Environment and Protection of Nature (MINEP) were created in 2004 from the former Ministry of Environment and Forests. The restructuring was in part an effort to address bottlenecks in the former ministry and create a structure to support implementation of the forest laws, community management and capacity building at the central and local levels. MINFOR is responsible for the development, implementation and evaluation of forest policy, the management and protection of national forests, the development and execution of programs for regeneration, afforestation, inventory of forest resources and management of hunting areas. MINFOR oversees the National Forest Development Agency (ANFOR), which is responsible for supporting forest regeneration and forest enterprises (Cerruti et al. 2008; GOC 2005b). The government’s 2010–2020 GESP targets the forestry sector as an area for growth and expansion. The National Forest Development Agency (ANFOR) plans to focus on: (1) developing forest plantations; (2) building the capacities of stakeholders in silviculture; and (3) developing the institutional and cooperation framework. Specific activities that MINFOR and ANCOR plan to undertake include: development of non-timber forestry products; promotion of processing of forest waste into energy; implementation of methods and technologies of proper use of firewood; development of hunting interest zones; and community management and game ranching. MINFOR will center its forestry production efforts on stabilization of exploited volumes of lumber and improved processing of same and of non-timber forest products (GOC 2009). The sector strategies set out in the 2010–2020 GESP follow MINFOR’s Forest Environment Sector Plan, which has guided institutional reform of the forest sector since 2006. Since adoption of the plan, MINFOR has hired 1,550 new employees, adopted an anti-corruption initiative and linked the ministry with research institutions and regional initiatives as part of a comprehensive capacity building effort. In 2009, the ministry began revising the legal framework governing the sector and has engaged independent observers to oversee concessions and forest activities. With support from the World Resources Institute and the Global Forest Watch, MINFOR published an interactive forest atlas that allows monitoring of forest concessions and changes in forest condition. The government has also undertaken readiness activities for participation in the UN collaborative program for Reducing Emissions from Deforestation and Forest Degradation (UN-REDD), which includes obligations for community consultation and participation in forest management. The multi-stakeholder 2008 State of the Forests report concludes that some progress has been made, but the ministry still face challenges managing finances and developing strategic, coordinated and participatory forest management activities (Cerruti et al. 2008; FCPF 2010; WRI 2007; Haskins 2009). Cameroon is a member of the Central African Forests Commission (COMIFAC), which is a group of forestry ministers from Central African countries and the primary authority for decision making and coordination of sub- regional actions and initiatives pertaining to the conservation and sustainable management of the Congo Basin forests. The Congo Basin Forest Partnership, an international association of more than 40 governments, international organizations, and private sector and civil society representatives that operates with COMIFAC, has identified the tri-national Minkébé, Boumba-Bek, Nki and Odzala National Parks and the Dja Wildlife Reserve (TRIDOM) as a priority landscape. At a COMIFAC meeting, Cameroon, Gabon and the Republic of Congo signed an agreement for a trans-boundary conservation initiative covering the TRIDOM area. The countries jointly manage the area, which has significant biodiversity and faces threats from poaching and illegal logging (CARPE 2010; University of Maryland 2010). With the support of numerous donors, in 2006 the government undertook a US $136 million Forest and Environmental Policy Development Program. The program has provided support for the reforms within the sector and will continue through 2011 to fund capacity-building and the strengthening of forest and environmental institutions by expanding their capacity for and work in environmental monitoring, policy oversight, law enforcement, forest management, biodiversity conservation and community-based forest activities. A separate Forest and Environment Policy Development Grant was provided through the World Bank and is designed to strengthen public and private efforts to achieve sustainable use of national forest and wildlife resources. As of December 2009, progress toward meeting the objective was lagging because the project had not met the conditions for the release of funds, and the project was therefore being extended (World Bank 2006b; World Bank 2009c). USAID provides significant support for Cameroon’s forest sector through the Central African Regional Program for Environment (CARPE). CARPE is a 20-year (1997–2016) regional initiative designed to address deforestation and biodiversity loss in a nine-country area of the Congo Basin. The program has a funding level of US $18.3 million for FY2011. CARPE is managed out of the Democratic Republic of Congo and includes the Global Forest Watch Network and participation in the Congo Basin Forest Partnership. CARPE activities include developing local, national and regional natural resource management capacity, including broader application of modern sustainable land management and planning practices, monitoring and verification of the forest resource base, and the strengthening of natural resources governance (institutions, policies, laws and law enforcement) (CARPE 2010; USDOS 2010b; USDOS 2009). Many donor agencies and international non-governmental organizations (NGOs) have invested in helping individual communities register community forests in Cameroon, including the Canadian International Development Agency (CIDA), the UK Department for International Development (DFID), the World Bank and global environmental groups such as the Worldwide Fund for Nature (WWF). WWF is also promoting a Central Africa Forest and Trade Network and helping companies to embark on the Forest Stewardship Council certification process. DFID and the Dutch SNV have created a Forest Governance Facility, designed to support civil society organizations, the private sector, media and research organizations in forestry (Pénelon 1997). The Centre for Environment and Development (CED), Reseau Recherches Actions Concertees Pygmees (RACOPY), and the Forest Peoples Programme (FPP) are national and international NGOs that work to promote and protect the rights of indigenous people in Cameroon. The group regularly reports to the African Commission on Human and Peoples’ Rights regarding issues affecting pygmy groups, including restrictions on their access to and use of forest products under forest legislation (CED et al. 2010). 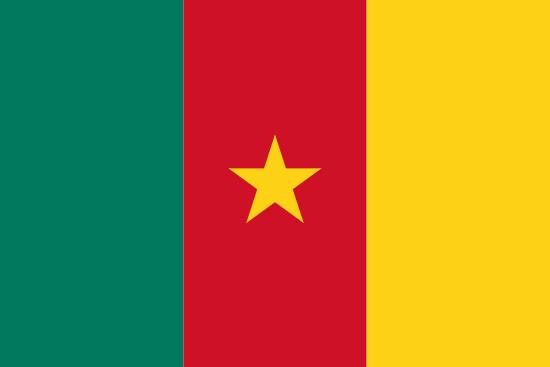 Cameroon has significant deposits of bauxite, cobalt, iron ore, nickel and uranium. Bauxite and uranium have been found in the far north of the country and in the southeast, cobalt and nickel in the southeast, and gold in the eastern region. Other mineral deposits include cassiterite, marble, mica, lignite, rutile and tantalite. Cameroon has proven reserves of about 400 million barrels of oil, most of which is located offshore in the Douala Kribi Basin of the Niger Delta. Most of Cameroon’s oil is exported, and crude oil and petroleum products have led Cameroon’s exports since at least 1978. Exploration for oil continues but no new discoveries of reserves have been found. Cameroon has one oil refinery located in Limbe, which can produce 45,000 barrels a day (Newman 2009; Indexmundi 2010; Cosse 2006; Subramamian 1994; GOC 2009; Mbendi 2007; Mega Uranium 2010). Historically, Cameroon’s non-petroleum mining industry has been limited by lack of infrastructure to support large-scale exploration and exploitation, and most mining has been the small-scale and artisanal production of diamond, gold, salt and various building materials. Artisanal mining produces 20,000–45,000 ounces of gold and 12,000 carats of diamonds annually and is most active in the east, south and Adamawa regions. About 15,000 people are employed full-time in artisanal and small-scale mining operations. The development of the Lom Pangar hydroelectric dam project is occurring in an area with gold deposits. The government engaged the services of Caminco to mine an estimated six tons of gold that would otherwise be lost with dam construction (Newman 2009; Mbendi 2007; Bainkong 2010). Beginning in about 2006, the government has increased its attention to the potential for growth in the mining sector and has actively encouraged foreign investment with new tax incentives and support for infrastructure development. Foreign investment in Cameroon’s mining sector has steadily increased since 2007, and active exploration programs are being undertaken for gold, uranium and cobalt-magnesium-nickel. The U.S. company Hydromines has formed a consortium with companies from the United Arab Emirates and India to mine bauxite. Sundance Resources is developing an iron ore mine in Mbalam with operations expected to begin in 2012. The company estimates that the operation will bring the country an estimated US $5 billion in benefits over the 20- year life of the project through royalties from the sale of iron-ore products, corporate and shareholder income taxes, dividends from the government’s equity interest in Sundance’s operating subsidiary in the country, CamIron SA, as well as taxes paid by employees (Swanepoel 2009; Reuters 2009b; Newman 2009). The Chad-Cameroon Pipeline runs from the southwest corner of Chad diagonally about 1,000 kilometers across Cameroon to an offshore floating storage and loading facility near Kribi. Construction of the pipeline and supporting infrastructure has required the expropriation of land previously used for farming and forests. The World Bank has provided loans to support the project, which the Bank approved on the basis of extensive environmental plans for addressing social issues and mitigating environmental damage. Nonetheless, the project has drawn criticism from local and international NGOs for inadequate planning regarding human impact, delays in compensation and failure to compensate for the extent of damage suffered by local communities. More recently, two large mining operations are using participatory mapping to determine indigenous peoples’ land uses within mining concession areas (World Bank 2006c; Amnesty International 2005; CED et al. 2010; Friends of the Earth 2008). The 2001 Mining Code provides that the country’s minerals are owned by the state and rights to minerals are separate and distinct from rights to land. Mining exploration and exploitation shall be conducted under state authorization, which is provided by permit or license. Only nationals may engage in artisanal mining; other mining operations may be conducted by nationals and foreign entities with residence in Cameroon. The state reserves the right to claim up to a 10% share in any mining concern operating in Cameroon (GOC Mining Code 2001). The Mining Code requires mining operations to take precautions to avoid environmental harm. Companies must prevent or minimize the discharge of waste into the environment, promote or maintain the general health of the local population, reduce waste and dispose of non-recycled waste in a safe manner (GOC Mining Code 2001). Cameroon has a separate Petroleum Code (Law No. 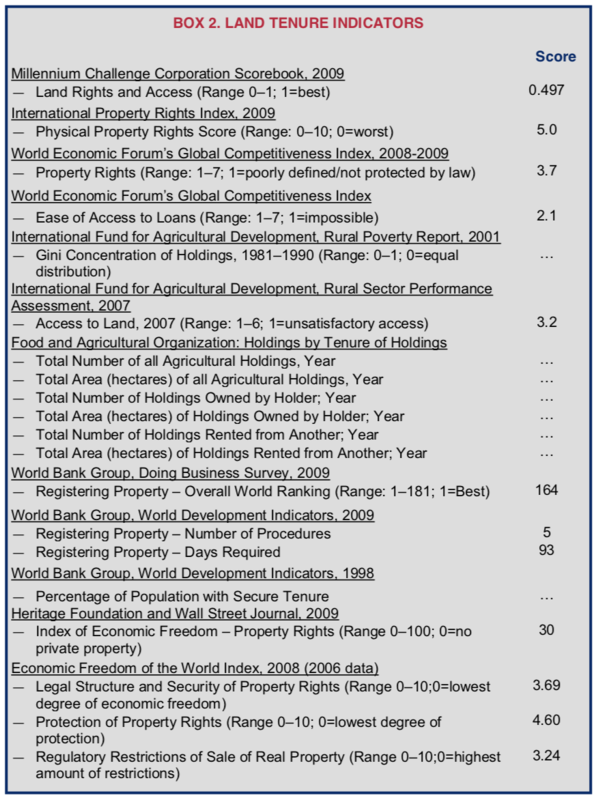 99/013 of 22 December 1999) that is currently being revised (World Bank 2008). The following rights are recognized by the 2001 Mining Code. Artisanal mining permits are granted to nationals for areas not to exceed 100 square meters. Artisanal operations are limited to a depth of 30 meters. Permits are granted for 2-year terms and are renewable. A licensee can obtain up to four permits, so long as they are on adjacent land. Reconnaissance licenses are available for 1-year, renewable terms for areas not to exceed 10,000 square kilometers. Exploration licenses are granted for 3-year terms and may be renewed for 2-year periods up to four times. Exploration licenses are granted for areas not to exceed 1000 square kilometers. Operating licenses are granted by the President for periods up to 25 years with the possibility of a 10-year renewal. Operating licenses require submission of a feasibility study and environmental and socioeconomic impact studies. Operating licenses allow the holder to build infrastructure and treatment plants, to use any water for mining operations and processing, and exclusive right to occupy the land. The Ministry of Industry, Mines and Technological Development (Ministre de l’Industrie, des Mines et du Développement Technologique) oversees mineral resource exploitation in Cameroon. The government’s state- owned National Hydrocarbon Corporation (Société Nationale des Hydrocarbures, SNH) manages domestic petroleum production. SNH assists government authorities in their financial relations with private oil companies, sells the government’s share of oil output (both in the international market and to the national oil refinery) and transfers the resulting oil revenue to the treasury. SNH is marginally involved in oil production and holds a 20% stake in Total, Pecten and Perenco, and other stakes in companies involved in downstream oil sector activities and non-oil-related activities (World Bank 2006b; FAO 2005). Cameroon’s 2010–2020 Growth and Employment Strategy Paper (GESP) plans for the government to foster and promote research, exploitation and processing of mineral resources necessary for the country’s economic and social development. Specific planned activities include: (1) creating a national mining company that will establish joint ventures with private entities; (2) establishing a mining development fund; (3) conducting impact assessment studies and improving the knowledge of private national and foreign investors on the geological and mining potential of the country; (4) developing training programs for nationals in the mining industry; and (5) promoting synergy among the various administrations involved in the development of extractive industries and coordinating their activities. The government plans to give priority to the processing of aluminum and steel in partnership with identified private national or foreign businesses and will expand existing operations and develop new operations in the bauxite-alumina-aluminum subsector (GOC 2009). Cameroon is a candidate country under the Extractive Industries Transparency Initiative (EITI), which is a global, multi-stakeholder initiative supporting socioeconomic development on the basis of transparent and accountable use of mineral resources. EITI requires establishment of accounting systems and national oversight committee. Cameroon is in the process of obtaining validation. The country has convened a multi-sector stakeholder committee, led by the Minister of Finance, and is preparing its final validation report (EITI 2010). The government established a mechanism to compensate communities for losses incurred as a result of the construction of the Chad-Cameroon pipeline. The disbursal of money caused significant social upheaval and conflicts within families and communities. The mechanism was criticized by local NGOs for failing to recognize women’s rights to land and natural resources and the traditional rights of the Baka community, whose forest use was restricted by the creation of national parks as mitigation measures (World Bank 2006c; Oyono et al. 2006; Endeley 2010). The government established an artisanal mining support and promotion framework (CAPAM). The program is active in 28 mining sites involving gold, diamond, sapphire, rutile, tin, salt and ornamental stone. CAPAM provides technical support and assists miners in channeling their production toward formal routes to markets. The program also support activities for women miners so they can settle in one place and enroll children in school (GOC 2009). The World Bank is supporting the US $20 million Cameroon Environmental and Social Capacity Building for the Energy Sector Project through 2014. The project, which was particularly designed in response to the Chad- Cameroon Pipeline Project assessment, is designed to help the government improve the management of and the accountability for environmental and social issues related to large infrastructure investments, with an initial focus on the energy sector. The project is an effort to: reduce the negative externalities of large infrastructure projects; develop a transparent, stable and fair framework for managing environmental and social risks that can improve the enabling environment for large infrastructure investments; and institutionalize information flow among the populations affected by large infrastructure projects, other stakeholders and political decision makers. The project includes components designed to strengthen the ministries responsible for managing environmental and social obligations of large infrastructure projects, establish frameworks to manage social externalities associated with large infrastructure projects, and support the environmental unit in the Ministry of Energy and Water to ensure that environmental and social issues arising from large energy sector infrastructure projects are addressed in compliance with international best practices. In addition, in 2010 the World Bank also committed another US $200,000 (for a total of US $700,000) for Mineral Sector Institutional Capacity Building and EITI Implementation (World Bank 2006c; World Bank 2008; World Bank 2010d).